Sequin Chair Caps Hoods WholesaleFree Shipping over $150 - US 48 Contiguous States! $9.98 Flat Rate Under $150 - US 48 Contiguous States! Wholesale sequin spandex chair caps, sequin lycra chair hoods, sequin stretch chair cap. Our wedding sequin spandex chair hood caps are made from a four way stretch high quality Heavy duty Spandex material with sparkling mini round sequins. Our sequin spandex chair caps are perfect fit on Chivari chairs. 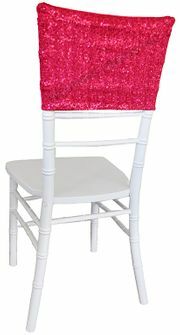 Sequin spandex chair cover, Sequin banquet spandex chair cover is perfect for Chivari chairs, Wedding, parties, celebrations or any special event.